Air BnB – what are the risks? The Strata Community Association had a seminar on the implications of running Short Stay Accommodation in a building controlled as a Community Corporation. Short stay accommodation is typically 1 night through to 2 months. Think about when you go on holiday to another city or town. The accommodation you say in is short stay accommodation. Community Corporation is a group of properties that share common space, these could be a group of units with common driveways, town house complex with a common driveway or an apartment building. All property owners within the space have voting rights within the Community Corporation Committee. Body Corporate Manager is the person that manages the Community Corporation business. Dwelling is a building or part of a building used for sleeping accommodation such as a house, unit, apartment or town house. The topic of “Airbnb” is emotive. For some people it is about cheap accommodation used by people out to party, but in reality it’s just short term accommodation that we have all used. Parking in the wrong areas. Personally meet each guest, they hand over keys and explain the building rules. They are an active member of the Community Corporation. They are known to the other residents and owners. They make sure to talk to them about what is happening with the short stay accommodation they are managing. 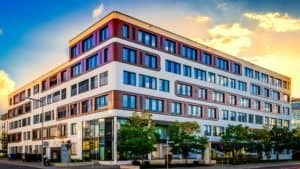 They only have sites where short stay is appropriate, for example they won’t manage a short stay apartment in an apartment building with majority owner occupiers as these two uses can conflict. Some of the other panel members spoke about other examples where things went wrong. However these are also happening with normal residents. The Community Corporation have the ability to stop dwellings from being leased out as short stay accommodation – under 2 months. For this to be legally binding they must have an adequate reason for introducing this bylaw, just “because we don’t like it” is not good enough. One of the panel members shared how their apartment is 75% owner occupiers over 60 years of age. These owner occupiers value their privacy, low noise, and personal safety. Where the apartment building adjacent to them is all rental accommodation, much of it mid length (3 – 6 months) and short stay accommodation. In the first example the bylaw would be appropriate while in the second case it would be a gut reaction to some isolated incidents. If you are thinking of using an apartment, unit or town house for short stay accommodation consult with the body corporate manager to find out if this is an appropriate use. There are different requirements for new hotels, motels and other forms of accommodation compared to a dwelling. It has not been legally tested in South Australia if the use of a dwelling for short stay accommodation changes the land use and therefore requires a planning application and subsequent upgrading of the fire and essential service systems. In an apartment building over 25m tall there is no real change between the two different land uses. In units and town house developments the most significant changes are related to the installation of smoke alarms. A dwelling only requires smoke alarms in paths of exit while a place for accommodation also requires smoke alarms in the bedrooms. Install some basic fire equipment, such as a fire extinguisher and fire blanket. You find one in every caravan park cabin, so why wouldn’t you have one in short stay accommodation. Have an emergency plan, this is a document to tell the person staying in your dwelling what to do in an emergency. Have all the fire equipment inspected and tested to ensure it will operate when needed. Using your dwelling for short stay accommodation is not a bad thing, it just comes with some risks that if managed well don’t create any problems. But if, like anything, they are not managed well problems are created. So do the right thing and everyone is happy.